On November 30 and December 1, 2018, Mr. Shinzo Abe, Prime Minister of Japan, attended the G20 Buenos Aires Summit held in Buenos Aires, Argentine Republic. 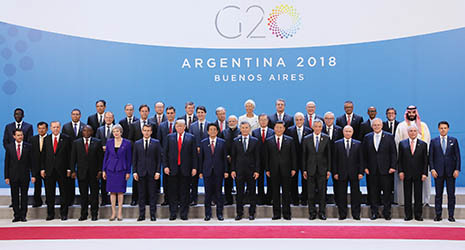 The main theme of the G20 Buenos Aires Summit was "Building Consensus for Fair and Sustainable Development" and based on this theme the leaders held frank exchanges of views on topics such as how the G20 will maintain unity and strengthen economic growth while facing some of the key risks, including financial vulnerabilities in emerging economies. G20 Leaders’ Declaration was adopted. At the retreat session for a high-level, frank exchange on the “Global Opportunities and Challenges in the Next Decade (e.g., artificial intelligence [AI], robotics)” (G20 members and Spain only), Prime Minister Abe as a lead speaker led the discussion. In his remarks, Prime Minister Abe advocated that new technological advancements have the potential to find solutions to social issues, such as aging population and environmental issues, and all people need to acquire literacy for mastering emerging technologies including AI. In addition, the Prime Minister stated that securing the free flow of data generates new values and innovation, and expressed his determination to continue the discussion in the lead-up to next year's G20 Osaka Summit and to lead rulemaking in the new era. At the closing session, Prime Minister Abe assumed the G20 presidency from President Macri, and expressed his determination for the G20 Summit to be held in Osaka from June 28 to 29 of next year. Prime Minister Abe stated that, as countries that lead the world economy, the G20 has a responsibility to discuss global issues and find solutions to them. He hoped that the Osaka Summit in June 2019 can promote the achievement of a free and open, inclusive and sustainable future society by driving world economic growth through promotion of free trade and innovation, and contributing to the simultaneous achievement of economic growth and disparity reduction and to addressing development and global issues with a focus on the SDGs. In addition, Prime Minister Abe stated that Japan would continue to take up the topic of “infrastructure for development,” which was an Argentine priority. He hoped that the G20 Summit can promote the strengthening of connectivity through quality infrastructure that Japan has advanced, as well as the provision of international public goods essential for global economic growth such as global health. In the area of energy and the environment, the Prime Minister underlined the idea of proactively attracting private investment to create a virtuous cycle of environmental protection and economic growth, rather than choosing one or the other. He looked forward to constructive discussion on the G20's contribution to global issues, including climate change and marine plastic litter.